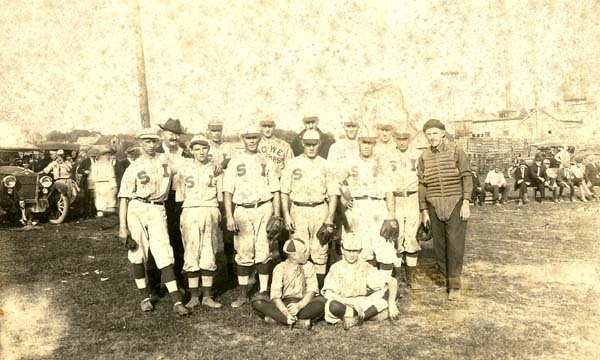 In 1920 and 21 Sunbury Independent baseball team played ball on the back lot of the Nestles plant. A year later the group joined the Capital City League in Columbus. Standing in back: John Loar, backer, Earl French, Dewey Miller, Cy Young, Jim Stark, and Donald Lake. "We beat Ashley during the Ashley Fair to win the tournament," Herb Kempton, a member of the team told The Sunbury News when this photo ran in 1938. Jarvis Bryant pitched against Sunbury that day and was signed up by the Milwaukee Brewers after the game. John Loar backed the club for several years. Emory Wickiser and Cy Young were pitchers with Earl French, county auditor in 1938 working behind the plate.